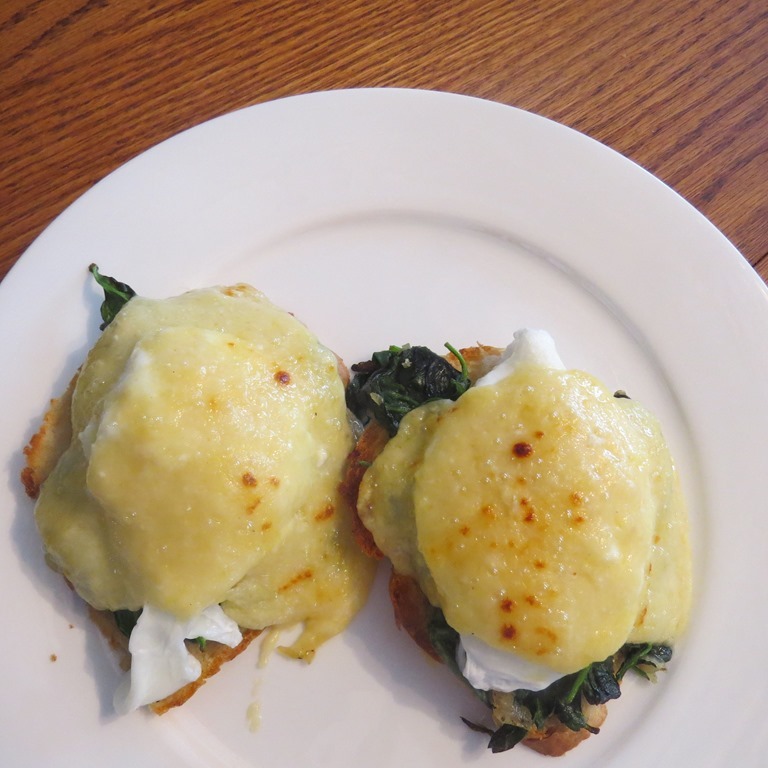 Eggs Florentine. | Leasa's Place. When Peter saw that I was sautéing spinach as a part of his breakfast he really had his doubts. Spinach for breakfast??? I told him not to worry, if he didn’t like what I was making, we could trash it all and quickly fry eggs and make toast. He said it looked like an awful lot of work for something we might (probably) wouldn’t like. I soldiered on as I really wanted to work on my egg poaching skills and I had the feeling this would be really, really good. First I sautéed two cups of fresh spinach with onions cut fine in olive oil. Once the spinach wilted, I set it aside. I then grated 2 cups of equal amounts of gouda cheese and Havarti. I place the cheeses into a microwave safe bowl and added 1/4 tsp of nutmeg and up to 1/2 tsp of fresh ground white pepper and 1/4 cup of whole milk. I loosely covered this and zapped it for 2 minutes. Then I whisked it vigorously and got it as smooth as possible. Then I added 1 tbsp of all purp. flour, whisked again, zapped for another 50 seconds. Whisk again, set aside. Okay, now toast either angle sliced (so they are bigger) 4 french bread slices or whole wheat bread slices. Put toast on an oven safe stone or cookie sheet. Put spinach mixture on toast making a nest for eggs. Now take a sauce pan and bring to a good boil 4 cups water and 1 tbsp vinegar. 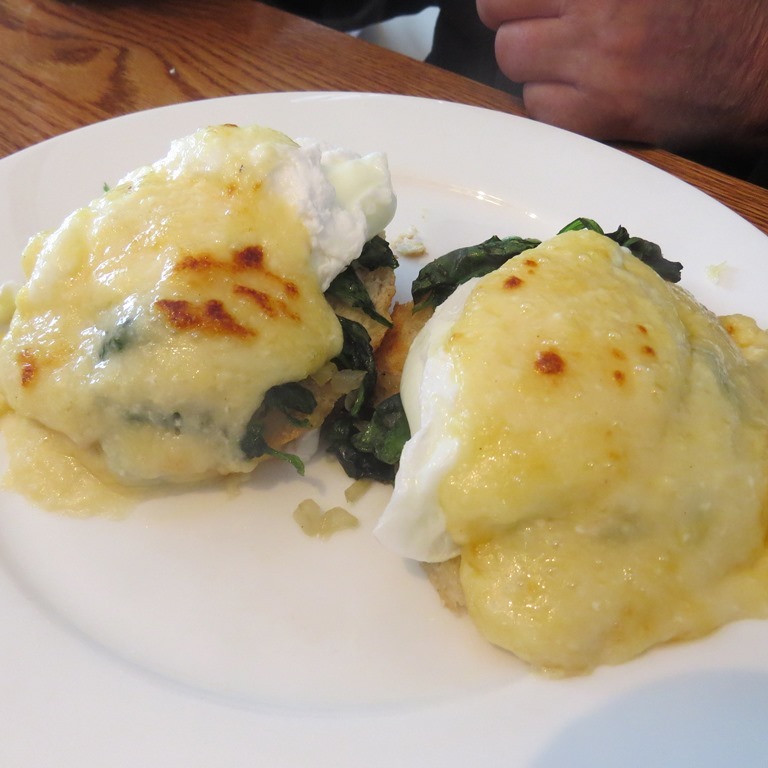 Now, one or two at a time (depends on how your poaching skills are) poach 4 large eggs. Takes about 3 minutes at a full boil. Don’t over cook the eggs! Carefully with a slotted spoon, scoop out your eggs and put on the nest. Peter said ‘THIS IS A KEEPER!’ AND LOVED IT. THE CHEESE SAUCE HAS TO HAVE 1/4 CUP BUTTER!!! !